Go West for the Wild Atlantic Way this year and enjoy the very best of Connemara in County Galway. Heed the wild power of the Atlantic Ocean as you drive narrow roads winding through the majestic landscape of the Twelve Pins and the Maamturk Mountains. Connemara is simply an unforgettable place to visit and the perfect day trip when you’re staying with Travelodge Ireland in Galway city. But what is it exactly that makes Connemara such a great place to visit? 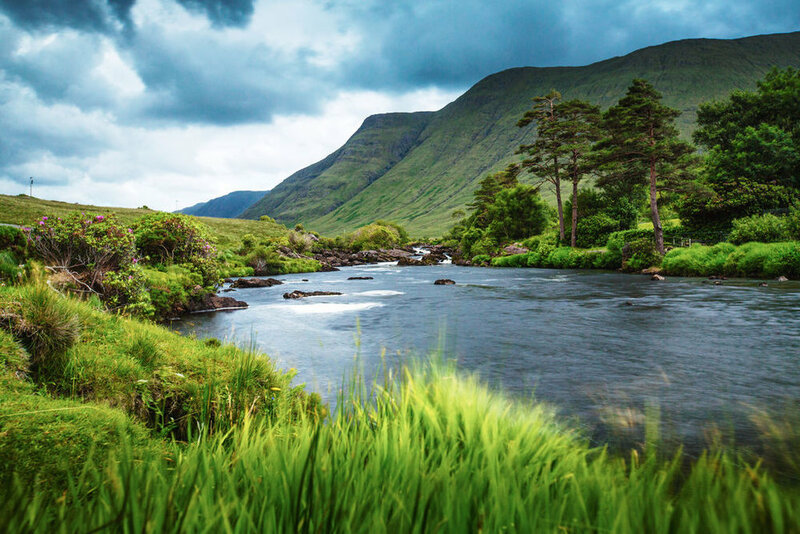 Connemara is perhaps most famous for its breathtakingly wild scenery and a day trip around the area will confirm that with stunning rivers, lakes, mountains, and amazing ocean views all contributing to what is one of the most beautiful parts of Ireland. Explore the Connemara National Park and see wild Irish landscapes in all their natural glory. While the park itself is almost 3000 hectares of unspoilt countryside with impressive walking trails to wander, there’s an excellent visitor centre to enjoy, tea rooms, a children’s playground and Connemara Ponies to ride. There aren’t many better Wild Atlantic day trips from Galway City than Connemara and there aren’t many better budget locations to stay in than our central Travelodge Galway Hotel. Every one of our Galway rooms has a comfortable bed, spacious en-suite bathroom and a flat screen TV as well as free and unlimited Wi-Fi to make your 3 star stay as comfortable as possible. Our cheap Galway hotel also provides efficient and friendly service as rewarded recently with a TripAdvisor Certificate of Excellence so you know you’ll be in the best hands when you stay with us in the West of Ireland. Why stay anywhere else in Galway when you can stay at the Travelodge Galway Hotel for less? If you come to Connemara for the Wild Atlantic Way, you must visit its capital, the friendly town of Clifden. A great place to pick up those tourist gifts like Irish woolly jumpers and the like, there are also superb contemporary Irish boutiques, local arts and crafts centres and plenty of good places to eat and drink and listen to Irish traditional music. Its location, nestled in a valley at the foot of the Twelve Ben Mountains but with stunning sea views, is also very, very hard to beat. The Connemara harbour village of Roundstone is definitely worth a visit when you stay with Travelodge Ireland in Galway city. Walk barefoot along the sands of the delightful Dog’s Bay and Gurteen beaches in the summer and enjoy the fresh local seafood in the village bars and restaurants all year around. Appreciate the best view of Roundstone coming from Clifden along the bog road with its outstanding route close to the Twelve Pins mountains. Connemara is a great place to just drive around, the wild Atlantic scenery is that good. Take the Connemara Loop which is the ideal way to discover the many hidden gems of the North West Connemara landscape. Tour through beautiful villages like Maam Cross or Leenane or stop at the many gorgeous beaches like Lettergesh or Glassilaun Beach. You will be stunned by Killary with the largest fjord in Ireland before ending back up in the lovely town of Letterfrack. Another great road to travel on is the Sky Road near Clifden. An amazing scenic route looking down on Clifden Bay from a height, the ocean views are so good that you need to make sure your driver’s eyes remain firmly on the road. The eight-mile road eventually loops back to Clifden but by then you’ll have taken some great pictures! Situated out in the middle of Galway Bay, the three Aran Islands, Inis Mór, Inis Meáin and Inis Oírr are very popular places to visit for visitors to the Wild Atlantic Way. And who can blame them when they’re such a great place to hear traditional music and explore the narrow winding roads, tight to the rocky shore, find out more about Irish culture, archaeology and history and gain a very different perspective on Irish life. Inis Mór is the biggest of the Aran Islands but Inis Meáin is perhaps the nicest to visit. It has all the attractions of the other islands but far fewer visitors so you can soak up that Wild Atlantic Way in your own time and at your own pace. All three islands can be reached by ferry from Rossaveal ferry port, only 20 miles from our Travelodge Galway City Hotel. Another Connemara highlight is Inishbofin, seven miles off the Connemara coast and is well worth the ferry trip from Cleggan. There are gorgeous sandy beaches, plentiful fishing, a 16th-century military barracks, cracking food and drink in the pubs and you can cycle around the island once you’ve made it across from the mainland.